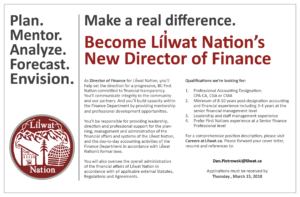 Interested in working for the Líl̓wat Nation? Take a look at our current job postings. To view the complete position description for the Director of Finance, please click here. When applying for a position, we encourage you to do so by emailing the contact person specified at the end of each posting. And please attach a resume in either MS Word of PDF formats. If you do not have a resume, or if you need to update your current one, please click here to use Powr Resume, a free, cloud-based, online resume-building program. Due to the volume of resumes it receives, the Líl̓wat Nation regrets that it can only contact applicants it wishes to move forward with to the interview stage.